Ami Vitale is thrilled to announce the release of her latest film, My Africa, which is a blue chip VR film on the Reteti Elephant Sanctuary, featuring voiceover by Oscar-winning actress Lupita N’yongo. Ami directed the film with Emmy Award-winning Passion Pictures, Vision 3, and Deep VR for Conservation International. My Africa premiered at the Tribeca Film Festival as part of the 2018 Tribeca Immersive program to a fantastic reception, where it ran at the Tribeca Festival Hub in NYC from April 20-28. The film made the Forbes Awesome list and the ABC News Best VR Round-Up from the festival. My Africa made its online debut on April 30. Since then, it has been written up by Mashable, Earther, and others. You can watch and share it here. I’m humbled and honored to named the first place winner in the 2018 World Press Photo awards for my National Geographic story “Warriors Who Once Feared Elephants Now Protect Them.” Thank you to all my friends at Reteti Elephant Sanctuary Community United for Elephants for trusting me to share your powerful story, to my editors Alexa Keefe and Sarah Leen for giving us the platform to share it and now to World Press Photo, for further casting the light on this important story of community and conservation. I was awarded a World Press Photo, Second Place, Nature, stories, in 2017 for “Pandas Gone Wild.” In 2015, I received a Second Place, Singles, award in the World Press Photo Nature category for “Orphaned Rhino,” which is also from my body of work on Northern Kenya, like this year’s prize. This work is a long term examination of the change in the relationship between people and animals in the region. In the photo above, keepers feed baby elephants at the Retiti Elephant Sanctuary in northern Kenya, the first sanctuary in Africa to hire indigenous women as keepers. Please have a look all of the World Press Photo stories. Some will break your heart, others may make you laugh and hopefully inspire all of us to work harder to find solutions to our planet’s most pressing challenges. You can also see my lecture at the World Press Photo Festival, where I shared the full arc of my photographic journey, including this story on the Retiti Elephant Sanctuary. 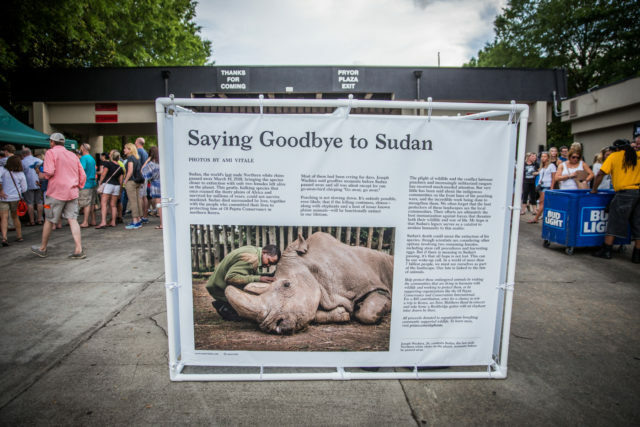 Ami Vitale’s photographs of the Retiti Elephant Sanctuary and the heartbreaking image of Sudan, the last male Northern White Rhino’s final moments are featured on 6 foot high cubes in the Dave Matthews Band Ecovillage. They will be on display there at the entrance to all 47 shows this summer, drawing attention to the importance of wildlife conservation.